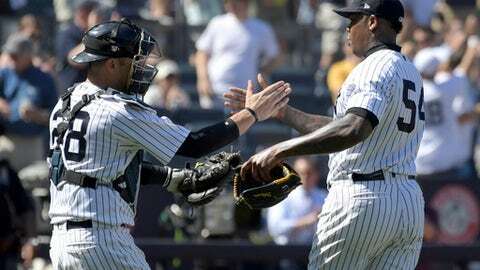 NEW YORK (AP) Aaron Judge and Miguel Andujar hit two-run homers off James Paxton in the first inning that sent the New York Yankees over the Seattle Mariners 4-3 on Thursday for a three-game sweep. MINNEAPOLIS (AP) – Rick Porcello allowed one hit in seven innings, Mookie Betts and Andrew Benintendi homered, and Boston beat Minnesota to avoid a series sweep. Arenado had just two home runs in his first 15 games of June, but has four in his last seven. He put the Rockies ahead 3-1 with a three-run homer in the first off Steven Matz (3-5), his 16th of the season. He delivered a two-run double in the second to drive in five for the second time this season. He also had five RBIs at the Chicago Cubs on May 2. Bryce Harper led off the eighth with a double off Mychal Givens (0-4) and Trea Turner followed with a single. After Rendon struck out, Soto hit a liner into the gap in left-center. Soto, a 19-year-old rookie, is batting .326 with 16 RBIs in 28 games. CINCINNATI (AP) – Jesse Winker hit his first career grand slam during a big sixth-inning rally, putting Matt Harvey in line for his second win for the Reds. Cincinnati sent 11 batters to the plate and scored six times in the sixth, matching their biggest inning of the season. Kyle Hendricks (5-7) walked three to set up the two-out rally, including Eugenio Suarez with the bases loaded. Hendricks has equaled his career high with four walks in each of his last two starts. Harvey (2-5) went six innings for his first victory since May 22, allowing five hits, including Javier Baez’s two-run double. He’d lost his last three decisions with the Reds, who got him from the Mets for catcher Devin Mesoraco in a deal on May 8. Jared Hughes pitched out of a two-on jam in the eighth and finished for his fifth save in six chances. MILWAUKEE (AP) – Brent Suter pitched seven strong innings, Manny Pina homered and the Brewers capitalized on a season-high four errors by the St. Louis Cardinals. Suter (8-4) retired 12 straight after Matt Carpenter’s leadoff home run. He went a career-high seven innings for the second time this season and third overall. The left-hander limited the Cardinals to two runs and two hits with a walk and five strikeouts. He is 6-1 with a 3.12 ERA in his last seven starts. ANAHEIM, Calif. (AP) – Luis Valbuena homered twice, Kole Calhoun connected for the second consecutive game and the Los Angeles Angels defeated the Toronto Blue Jays. Mike Trout went 0 for 2 with three walks in his 1,000th career game, ending his hitting streak at eight games. Trout, who has reached base in 31 of 47 plate appearances over his last nine games, was the designated hitter and is not expected to be used in the outfield during the series against Toronto because of a sprained right index finger. Calhoun hit a two-run homer off John Axford (1-1) in the fourth to put the Angels ahead 4-3. Valbuena made it 6-3 with his two-run shot in the fifth, ending an 18-game drought without a home run. He added a solo drive to right in the seventh for his eighth career multihomer game. Noe Ramirez (3-3) retired all eight batters he faced in relief, striking out four. Justin Anderson got his third save.